For Ajit Singh, a computer engineer who worked for companies like IBM for 15 long years in the US, politics was in his blood. But he never thought he would enter politics nor his father was keen that he succeeded him. Singh remembers that Charan Singh, the formidable Jat leader who rose to become Prime Minister, did not even know that his son had entered politics as he was bed-ridden and in coma then. The 74-year-old leader, who still commands support among Jats though in diminished numbers, thus saw his life changing. He was elected to Rajya Sabha in 1986. The next year Charan Singh breathed his last and demands were there for Singh to assume the party leadership. But fellow partymen Mulayam Singh Yadav and H M Bahuguna had other plans. They revolted and split the party taking away the backward sections with them. Jats did not desert him and Singh’s clout did not get diminished. Depicting political acumen, he merged his party with Janata Party next year to become its President. In 1989, Janata Party merged with V P Singh’s Jan Morcha to form Janata Dal. Singh contested for Lok Sabha from Baghpat, his father’s constituency for years, and won. He became Industries Minister. Not the one to be left out of power for long, Singh joined Congress in mid-1990s with a large chunk of his Janata Dal colleagues and became a minister in P V Narasimha Rao government. In 1996, he won from Baghpat on a Congress ticket but same year he performed another somersault and formed Bharatiya Kisan Kamgar Party. He resigned from Lok Sabha and contested the by-poll to win again. He supported the United Front government and contested the 1998 elections but bit the dust for the first time from Baghpat. To date that was his only electoral defeat. The next year, he had a sweet revenge, overcame the challenge from the same candidate who defeated him. This time with BJP-led NDA in power, Singh switched sides to become Agriculture Minister in A B Vajpayee’s regime. He also supported BSP only to withdraw support in 2001 resulting in collapse of the Mayawati government. When Samajwadi Party came to power in 2002, he supported the party but withdrew support just before Assembly polls. In 2009, he joined hands with BJP in the Lok Sabha elections. But two years later, he struck a deal with Congress before the UP Assembly elections and entered the Union Cabinet again. 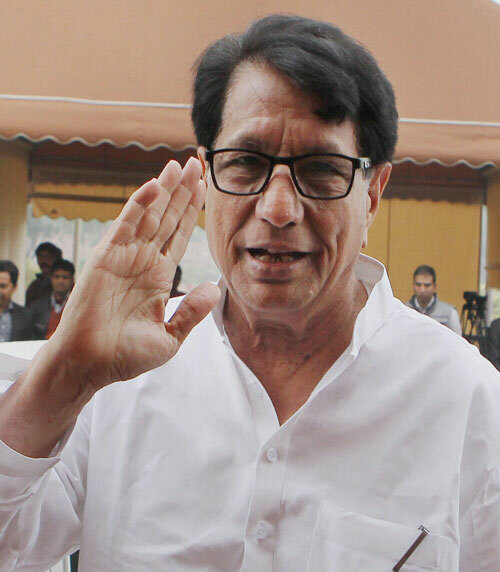 Where will Ajit Singh land during coming elections? Rumours in capital’s power corridors say he has struck a deal with BJP already. Put the question to him on aligning with parties of every hue during his over 25 years of politics, Ajit Singh will shoot back — Mulayam Singh Yadav aligned with a number of parties, V P Singh crossed over from Congress, collaborated with the BJP and launched a third front and you say I am inconsistent. Nobody may be able to read his mind but one should not forget his party’s hold in western UP used to make him an important ingredient of any alliance. In a fractured mandate, even a few numbers will have its value. Last year’s Muzaffarnagar riots seem to have eroded his hold over the region with his crucial Jat support withering away. This could spell trouble for RLD in long run as its mass base would be usurped by BJP. Already there is a feeling among Jats feel that Singh did not support the community during riots. It will be a hard task for Singh to maintain the grand Jat-Muslim alliance in tact. TAILPIECE Singh is an alumnus of IIT-Kharagpur and Illinois Institute of Technology in Chicago. He has a son Jayant, an MP from Meerut, and two daughters. He announced his entry into politics in March 1986 in a rally, where he is said to have been gifted a green coloured Maruti Gypsy by his followers. A practical politician, he knows he cannot become Chief Minister of Uttar Pradesh. He is a votary of the movement for reorganising large and administratively unwieldy states, including Andhra Pradesh, Maharasthra and UP. So why not support proposal of dividing UP into four parts and that he can become Chief Minister of one?